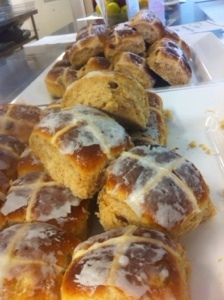 Today’s mission was to create hot cross buns for the girls at Brisbane girls grammar school. Make the ferment, make the dough, prove for 40 mins, knock back prove for 20 mins, weigh and ball into trays, prove until double , brush with egg wash, pipe on the cross(just flour, oil and water), bake in old stony (our ancient bakers oven), turn often to escape the shocking hot spots, cool in tray for 5 mins, dust with icing mix and return to oven to melt the sugar a little. Alternatively make a sugar syrup and slap in on top with pastry brush like your painting a fence(this will create a creamy fondant icing). Turn out of tray and savour the magic smell of yeast and spice before you tray and serve.